“I am the living bread that came down from heaven; whoever eats this bread will live forever; and the bread that I will give is my flesh for the life of the world.” Some would say that we Catholic are foolish to hear the words of Jesus in this gospel and come to our understanding of Eucharist. I once had a conversation with a young evangelical whose mission that day was to convince this Catholic priest that I just did not understand the Gospel of John. He pointed out parallels of language, chiastic repetition, midrashic argument structures, the nuances of Greek words and lots more. He understood lots of things – and he was correct in what he asserted that belief in Jesus was the gateway to salvation; to that I said “Amen.” I wonder if he silently thought, “Alleluia, I have just convinced a Catholic priest that these readings were about belief and not about Eucharist?” Hardly. I could have given even more technical arguments that he had given. And used them to show that John’s Gospel proclaims both the Word and Eucharist, together, as God’s gift in and through Christ. But at some point I came to realize that you all reach a crossroads. Will you insist on “understanding and explanation” or are you willing to let go and enter the mystery. The mystery that Jesus feed 5000 people and then promised that this food would always be available to all who believe. The mystery that in the middle of a Passover ritual, when there are no words, Jesus spoke the words, “This is my body”, “This cup is the new covenant in my blood” (Lk 22:20). The core mystery of salvation that what Jesus promised to the 5000 and all generations to come would be played out beginning with the Last Supper and continuing through to his being lifted up on the Cross, And that the mystery, that sign of the love of God, that same moment of time is here among us, an eternal moment where past, present and future are here, now. Where we in our time and mystically joined to the generations of believers past and to come, we are joined to the choirs of angels, and give witness to Jesus’ words: “I am the living bread that came down from heaven; whoever eats this bread will live forever; and the bread that I will give is my flesh for the life of the world.” It is pure mystery. Some would say that we Catholic are foolish to hear the words of Jesus in this gospel and come to our understanding of Eucharist. Well I would simply say that we do not come to an understanding; we come to the mystery. The mystery that God “so loved the world that he gave his only Son, so that everyone who believes in him might not perish but might have eternal life.” (Jn 3:16). For the last 4 weeks in our hearing of the Gospel of John, the evangelist has proclaimed over and over again – the central tenet of John’s Gospel – that we are to believe into the Jesus of Nazareth as the One sent by God to bring salvation, to bring eternal life. “For this is the will of my Father, that everyone who sees the Son and believes in him may have eternal life, and I shall raise him (on) the last day.” (Jn 6:40) Understanding resurrection or accepting the mystery that we will be raised on the last day? Understanding or mystery: eternal life? Not a whole lot of understanding and explanation there. It is just as much mystery as God’s love for us, God’s sending his only Son, and now belief in Jesus as the gateway to resurrection and eternal life. If as Catholic Christians seek “understanding and explanation”, we will be disappointed. But if we come to kneel in worship before the mystery of God as Father, Son and Holy Spirit – then the riches of God’s love can overwhelm us. There was a time when I would have entered the debate with that young man – traded Greek aorist tenses, midrashic argumentation – heck I would have begun to quote writings from the 1st century onward for a millennia all showing that Christians had always understood Eucharist as the sacramental Real Presence of Jesus – the bread of life come down from heaven that we who believe may have eternal life. But no more. Now I just invite people into the mystery of God’s love. Into God’s embrace; into the great silence where no words are needed, where love, that mystery of mystery is experienced, more fully, more completely than we can ever imagine. See the love of God for you in this Eucharist. Open your arms, life and hearts wide to receive that love. You were created in love, endure in love, and are called to grow more completely, more fully in love. Today in this Eucharist, again you enter into the mystery of love, a life given for the salvation of the world. Receive love, become love. 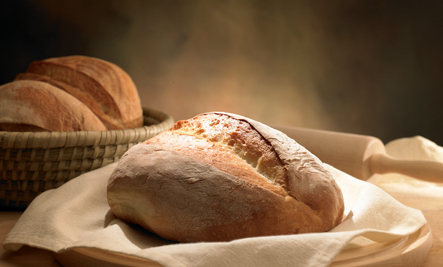 This entry was posted in Sunday Morning and tagged God's Love, John 6:51-58, living bread by Friar Musings. Bookmark the permalink.